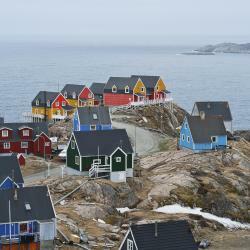 Offering an in-house restaurant and a sauna, The Red House is located in the East Greenlandic village of Tasiilaq. All the heated guest rooms include free WiFi access. Very special and interesting place. Unusual atmosphere, travelers and adventures. Great owner Robert Peroni-famous arctic traveler. He wrote a book about Greenland. Nice and kind people, warm. Greenlandic food. Hotel like a museum. Free pick up. Set 15 minutes’ walk from the town centre of Ilulissat, Hotel Avannaa has spectacular views of the world famous Ilulissat Icefjord. It was a great start to be met from the Arctic Umiaq boat in the harbour and driven to the Hotel. They also took us to the airport at no extra charge when we checked out. It's a good bed and breakfast base and there are simple self-catering facilities in the room. Good and tasty selection of breakfast items. We took the recommendation to have evening meals in the cafe bar of the neighbouring Hotel Arctic. The advice about the best hike to see the ice field was very helpful. It is modern, clean and welcoming. Hotel Arctic เป็นโรงแรมระดับ 4 ดาวที่ตั้งอยู่บน Ilulissat Icefjord ซึ่งได้รับการขึ้นทะเบียนเป็นแหล่งมรดกโลกโดยองค์การยูเนสโกและอยู่ทางตะวันตกของ Greenland... Excellent hotel and service, and the shuttle service to the airport and to the town is very appreciated and helpful. Hotel Icefiord ทันสมัยตั้งอยู่ห่างจาก Arctic Circle ทางทิศเหนือเป็นระยทาง 200 กิโลเมตรในภาคตะวันตกของ Greenland และห่างจากใจกลางเมือง Ilulissat เป็นระยะทาง 1 กิโลเมตร มีบาร์... Loved the room and its beautiful view. Friendly staffs, good breakfast & dinner, walkable to Ilulissat city center and beautiful surroundings. Free shuttle to and from airport on arrival & departure. Hotel Sømandshjemmet Nuuk is located in Nuuk. Among the various facilities of this property are a terrace and a shared lounge. All rooms have a flat-screen TV with satellite channels. Wonderful, helpful and friendly staff. Alan (who I think is the manager) sets a great example by being so welcoming and friendly and full of helpful knowledge about Nuuk. This is also a good place to buy souvenirs. I was checking around and they have the nicest things (art and gifts) and the best prices. Also they have a really good restaurant. I stayed a few days and I like their restaurant best for lunch and dinner. The breakfast was included and was wonderful! I was there over the weekend and noticed that a lot of local families would have a Sunday brunch there as it is the best food in town and a really nice atmosphere. I liked this place so much that I hope to take another holiday to Nuuk soon and will definitely stay here. Finally the staff is multilingual and their English is better than most native English speakers. This was useful for me since they helped translate things for me. Blue Trail Guesthouse in Ilulissat provides adults-only accommodation with a terrace and a shared lounge. The accommodation features a shared kitchen and luggage storage space for guests. A wonderful hostel that really exceeded our expectations! Clean, warm and close to beautiful nature and Greenlandic dogs! This Greenland hotel is located just 40 km from the Polar Circle and offers a 24 hr reception and a cafeteria. 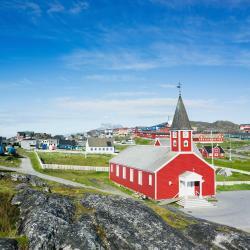 Sisimiut Harbour is just a 5-minute walk from the property. Nice hotel with a history, nice location in the town centre with short walking distances to most of Sisimiut. Friendly and forthcoming staff. Traditional and good food, also popular place for local community. 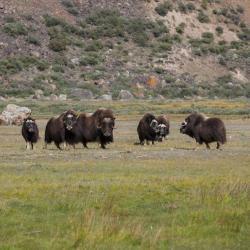 จากที่ตั้งของ Hotel Kulusuk ความงดงามที่น่าดึงดูดใจของเกาะกรีนแลนด์และประเพณีท้องถิ่นที่โดดเด่นเป็นเอกลักษณ์อยู่ใกล้เพียงแค่เอื้อม... The facilities, surroundings, and (certainly not least) the staff. A beautiful setting, in which one can comfortably unwind, and enjoy nature. Who knows... Maybe you will get to see some northern lights, as well. 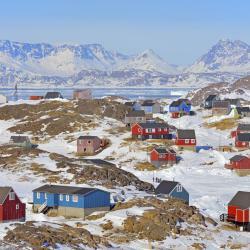 Hotel Angmagssalik ตั้งอยู่ในภูมิทัศน์ที่ซ้อนหลั่นกันเหนือหมู่บ้านที่งดงามของ Tasiillaq ใน Greenland ให้บริการห้องพักแสนสบายและบุฟเฟต์อาหารเช้า ท่านสามารถไปยังหมู่บ้านแห่งนี้ได้โดยเฮลิคอปเตอร์ที่... The owner Mike is so hospitable and friendly. Yew Lin was very kind carrying my bags to my room for me (I have a bad leg), and he was very knowledgeable about the area and very patient with all my questions about the area. Breakfast was really good, and the view unbeatable. I really enjoyed my stay and hope to visit again. Also the hotel picked me up from the airport, which was really helpful. The hotel picks up all guests that are flying in which is great. Finally the hotel can arrange trips around the area. Nattoralik features free WiFi and views of sea in Aasiaat. This 4-star hotel offers free shuttle service. Guests can enjoy mountain views. At the hotel, the rooms are fitted with a desk. Featuring accommodation with a terrace, The Blue Ice is situated in Ilulissat. The property was built in 1982, and features accommodation with free WiFi. Set in Nuuk, Vandrehuset 1-3 has a terrace, shared lounge and free WiFi. Some rooms come with a kitchen with a dishwasher and an oven. I already knew about the accommodation and it was full of only good comments so I very much looked forward to staying there. Everything was prepared and it was just so good and comfortable and cozy. 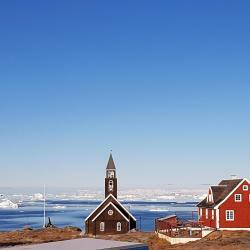 B&B Geisler is located in Ilulissat. It offers simple, carpeted rooms with views of the glaciers and Baffin Bay. Bathroom facilities are shared at B&B Geisler. This B&B is home of a Greenlander couple, Mona and Hans. They are very kind people. They speak little English but sufficient for daily communication. Note that they don't allow guest to use kitchen as they have a very high standard of cleanness. The description on Booking.com need to be corrected. With lower price compared with other places to stay in Ilulissat, I save myself with sufficient budget to dine out every day without the trouble to cook and clean by myself. They only have one single room and one double room for guests. So it means bathroom will be shared by max 5 people. The place is 10 min walk to nearest supermarket and 20min walk to center of town. This may seem a bit distant for some people, but if you are going to walk the trails, you are going to walk anyway. And if you join tours, you get one or both ways transportation. This B&B is very close to seaside and the starting point of yellow track. When I looked outside the window and found there are good sun light, I just go out and grab some quick shoots/video of icebergs. Bed is very warm and comfortable. Definitely won't be available for other hostels at similar price. Breakfast: two kinds of bread, coffee or tea, milk, butter, cheese, Nutella, jam, and cereal. Simple but everything with quality. I'm not picky on coffee, but other guests and myself all think their coffee is good. House is very clean and quiet, you can hardly notice the hosts are at home. They respect your privacy and expect you the same. Pls be quiet if you return late. In summer, sun is up 24hr. The curtain in the room provides good shade. But if you want a completely dark room, don't forget to bring your own eye covers. Originally I'm a bit worried how to get there from Airport. Hans replied me that there are always taxi in the airport and I didn't have any trouble getting one. ที่พักนี้ตั้งอยู่บนชายฝั่งทะเลด้านตะวันตกของเกาะกรีนแลนด์ (Greenland) ในเมืองอิลูลิสเซท (Ilulissat) และให้บริการสตูดิโออพาร์ตเมนต์ทันสมัยพร้อมห้องครัวขนาดเล็ก... perfect location and perfect facilities. Also good for the transportation arrangements. Nice staff. And perfect location - as it's in the town center. 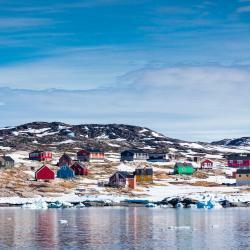 Nuka Hostel is offering accommodation in Ilulissat. All rooms boast a kitchenette and a private bathroom. Free WiFi and free shuttle service are offered. Very clean and comfortable! Excellent location - very close, literally 3 minute walk to World of Greenland office and town centre with grocery supermarkets. Staff was friendly and picked me up from the airport.